Rather suddenly, the state issued fiat currency bolivar lost 99% of its purchasing power. Gresham's law holds that "bad money drives out good money," meaning that given a choice of currencies (broadly speaking, "money" that serves as a store of value and a means of exchange), people use depreciating "bad" to buy goods and services and hoard "good" money that is appreciating or holding its value. As this dynamic plays out, eventually there is little "good money" in circulation and the economy suffers accordingly. 1: Discussions surrounding Bitcoin and Gresham’s law immediately devolve into a debate about historical formulation or wording of Gresham’s law. Gresham’s law includes the notion that one or several currencies must be accepted at a defined value under legal tender law. However, the wider economic phenomenon that “powers” Gresham’s law is a universal phenomenon that is independent of any particular legal or cultural context. To wit, in economic exchange where the seller will accept two different commodities as payment, the buyer will tend to pay with the commodity that in his own eyes is of inferior or lesser value. When this phenomenon is replicated in a large number of economic exchanges, and in reference to the same two commodities, this results in the “bad” currency driving from circulation the “good” currency, as buyers in the marketplace pay with the inferior or lesser-valued commodity (as viewed from their own point of view), when the seller will accept two different commodities as payment. 2: This phenomenon, which we could refer to as Gresham Effects, is independent of the legal framework operating at any given time. If you will accept as payment milk with an expiration date two days from now or milk with an expiration date ten days from now, I will tend to pay you with the milk with an expiration date two days from now. If many similar exchanges occur in the marketplace, this will result in the “bad milk” driving driving the “good milk” from circulation as market participants routinely offer only the milk expiring in two days in their exchanges. 3: Therefore, if in the marketplace sellers are willing to accept either Bitcoin or fiat currency as payment, the phenomenon Gresham Effects tells us that buyers will offer the commodity they view as inferior or of lesser value in these economic exchanges. If market participants generally view fiat currency units as inferior or as lesser in value than Bitcoin currency units, and if this value judgment is repeated in many economic exchanges, this can be expected to result in the “bad” money (fiat) driving the “good” money (Bitcoin) from circulation. Since Bitcoin was not in wide circulation to begin with, Gresham Effects in this case has the effect of preventing or suppressing the wide-scale use of Bitcoin as an exchange currency. This situation can be expected to last for as long as sellers are willing to accept either fiat currency or Bitcoin as payment and buyers view Bitcoin currency units as superior or of greater value than fiat currency units. In short, due to Gresham Effects Bitcoin will not become a widely circulating medium of exchange while these conditions persist. Interpretation: To me, this indicates or implies that Bitcoin’s use case is more as a ‘reserve currency/store of value’ and less as a currency for use in daily transactions. In general, I will not relinquish my Bitcoins in exchange for t-shirts or Snickers bars if the seller will accept either Bitcoin or fiat currency. I will prefer to pay for t-shirts and Snickers bars using fiat currency. On the other hand, when I want to purchase something and I do not have enough fiat currency to pay for it, in this case I may use my “reserve” currency, Bitcoin. For example, if I want to purchase a house and I only have enough fiat currency for 20% of the price, in this case I may use my reserve currency to pay the other 80%. This example assumes that paying the full price by fiat currency is not an option. If I had enough fiat currency to pay the entire price I would pay by fiat currency. The significance here is that those who are envisioning a future in which Bitcoin becomes a widely circulating medium of exchange may be envisioning something that is at odds with the laws of economics. Both economic law and empirical evidence seem to indicate that due to Bitcoin’s strictly limited supply, market participants may refrain from offering Bitcoin as payment in daily transactions. Bitcoin may have very important use cases, but its most most important use case may not be a widely circulating medium of exchange. Thank you, AK. As anyone who follows cryptocurrencies knows, the objections to cryptocurrencies and bitcoin specifically are legion: it's not stable, it can't be trusted, it isn't "real money," etc. I'd like to illustrate "real money" with a chart of the bolivar, the national currency of Venezuela. 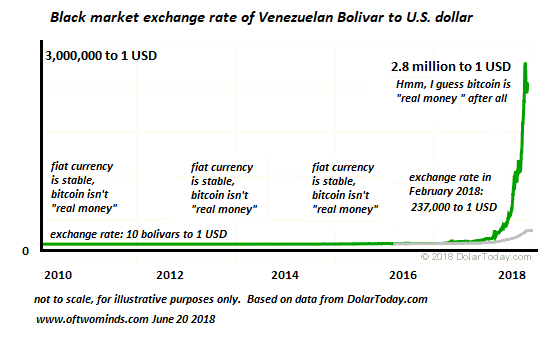 Note that until relatively recently the bolivar traded (at least at the official rate) at around 10 bolivars to one U.S. dollar (USD) and around 25 to the USD on the black market (i.e. free market). These exchange rates slowly moved higher, but few expected the bolivar to depreciate to an appalling free-market rate of 100 to one USD. Rather suddenly, the state issued fiat currency bolivar lost the majority of its purchasing power. This loss of purchasing power, also known as inflation, gathered momentum and is now at hyper-inflationary rates: a few months ago it only took 237,000 bolivars to buy one USD, and now in June it takes 2,800,000 bolivars to buy one USD. Not to put too fine a point on it, but the Venezuelan citizen who converted all the family's bolivars to bitcoin two years ago (June 2016) would have preserved the purchasing power of their "money." So while the Bank of International Settlements (BIS, which is owned by 60 central banks) is pleased to declare bitcoin untrustworthy and in effect, not "real money," unlike the stable, secure, trustworthy fiat currencies issued by central banks, it pays to reconsider Gresham's law before concluding bitcoin isn't "real money." Kindle edition now $2.99, print edition now $6.95. Kindle edition now $2.99, print edition now $9.95.